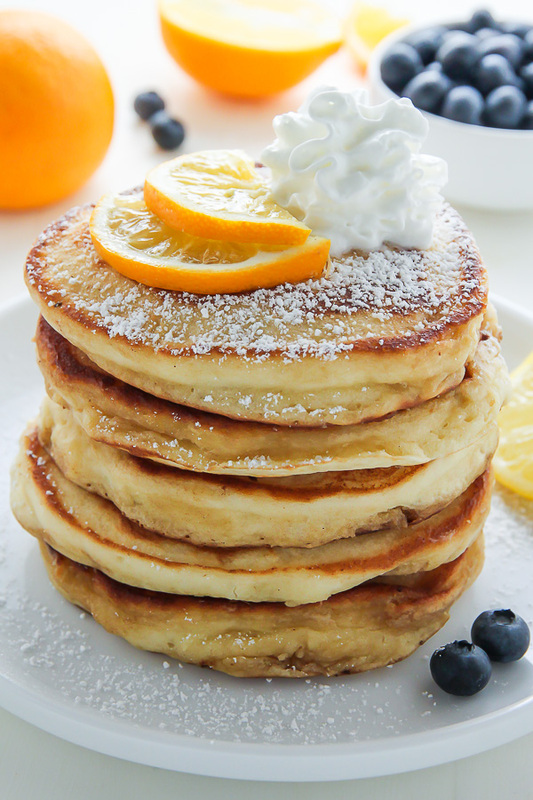 Super soft and fluffy Lemon Ricotta Pancakes made from scratch! Bonus: This recipe is freezer friendly. Good morning and happy Sunday! If you’ve been reading my blog for a while now, you probably already know my feelings for pancakes is no fleeting love affair. Over the past 5 years (where does the time go?!) I’ve shared classic recipes like the blueberry pancakes of your dreams and my favorite buttermilk pancakes, as well as crazier combinations like malted chocolate chip banana pancakes and HEALTHY Greek yogurt zucchini pancakes. So many of you have made these pancakes and sing their praises, letting me know I’m not alone in this pancake addiction 😉 ← Thank you for that! 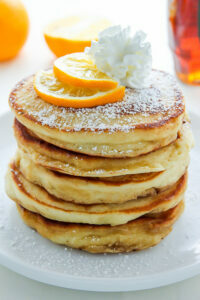 And today, we get a new pancake recipe for the breakfast archive: Lemon Ricotta Pancakes! Each bite is light as air and perfectly flavored with fresh lemon and just a hint of vanilla. So let’s get down to business. To make these Lemon Ricotta Pancakes you’ll need all-purpose flour, granulated sugar, baking soda, baking powder, salt, fresh lemon juice and zest, eggs, ricotta cheese, milk, and vanilla extract. You’ll also need fresh whipped cream and/or maple syrup for serving. As you can see from my photos, I went the whipped cream route. I also served the pancakes with fresh blueberries for a pop of color, but any berry would be delicious paired with these pancakes. The batter comes together in just minutes. Due to the nature of ricotta cheese, it will be quite thick, but don’t fret over this. Because once the batter hits the hot griddle, it will puff up and morph into fat, fluffy lemon ricotta pancakes. YUM. My secret for keeping pancakes warm while I cook them all is to preheat the oven to lowest setting and place a large baking sheet inside. As the pancakes are cooked, I transfer them onto the baking sheet. Be sure to use a potholder when removing the pan as it will be very hot! Completely cool the pancakes, then place them between layers of waxed paper, then place them in a freezer-safe plastic bag, and pop them in the freezer! They will keep in the freezer for 2 months! There are two ways you can do this! There’s the microwave method in which you’ll place the frozen pancakes on a microwave-safe plate and heat them in the microwave, uncovered, for 1 to 2 minutes, or until they’re heated through. Then there’s the conventional oven method, in which you’ll arrange the frozen pancakes in a single layer on a cookie sheet, cover with foil, and bake at 375 degrees (F) for 5 to 6 minutes, or until they’re hot and heated through. If you try this recipe for Lemon Ricotta Pancakes, let me know what you think! Leave a comment below, and don’t forget to snap a pic and tag it #bakerbynature on instagram! 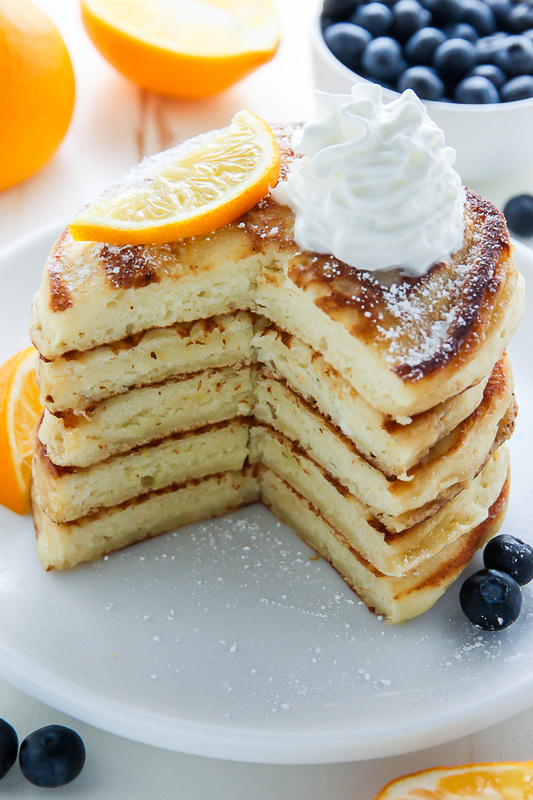 Soft and fluffy Lemon Ricotta Pancakes made from scratch! Pour batter by 1/3 cupfuls onto a buttered hot pan or griddle, adding only a few at a time so that they do not blend together. Cook for about 3 minutes before flipping them over, or until small bubbles form on top. Cook on the second side until golden brown, about 1-2 minutes. Repeat with all pancake batter. Serve pancakes warm, with syrup or whipped cream. See notes for freezing options. To freeze: place cooled pancakes between layers of waxed paper, then place them in a freezer-safe plastic bag, squeezing out any excess air before sealing the bag and placing it in the freezer. Pancakes will keep in the freezer for 2 months. To reheat, heat your oven to 375 degrees (F). Place the pancakes in a single layer on a large baking pan; cover with tinfoil and heat in a preheated oven for 6-8 minutes, or until warm. You may also microwave 3-4 pancakes at a time for about 40 seconds, or until heated through. Thank you for all your helpful tips! I made these this morning with great results. So fluffy and light as air. I served with rasberries and whipped cream. Hi Many! So happy these pancakes were a success for you. And thanks for letting us know how you served them – sounds so delicious! Hi – can this recipe be halved? Trying to use up leftovers and I am low on eggs – was hoping to use 1 egg. Thanks! I liberally halve and double recipes with no problem! I’d say yes. The best pancake recipe ever! We serve these with fresh blueberry compote. My middle daughter refuses to eat anything else. And my picky 1 year old loves them just as much as she loves the blueberry compote. They freeze really well, so I don’t have any problem making multiple batches. Thanks for such an awesome recipe! How many pancakes does it makes? Ricotta cheese in this dish taste out of the world, Ashley! I think that the way we freeze this pancakes is very good to preserve the ricotta cheese ingredient in that dish! I want to make these a day a head and grill the the next morning can this be done? These pancakes look so tasty!! I love trying different pancake recipes! I will have to try this one soon! These are such beautiful pancakes! Yum! These are absolutely delicious! My new favorite pancake. The pancakes looked so good, I want to try them. I doni only have cottage cheese right now , can I use this instead of ricotta cheese? Thanks. These were really delicious! I paired them with homemade blueberry syrup and it was to die for. 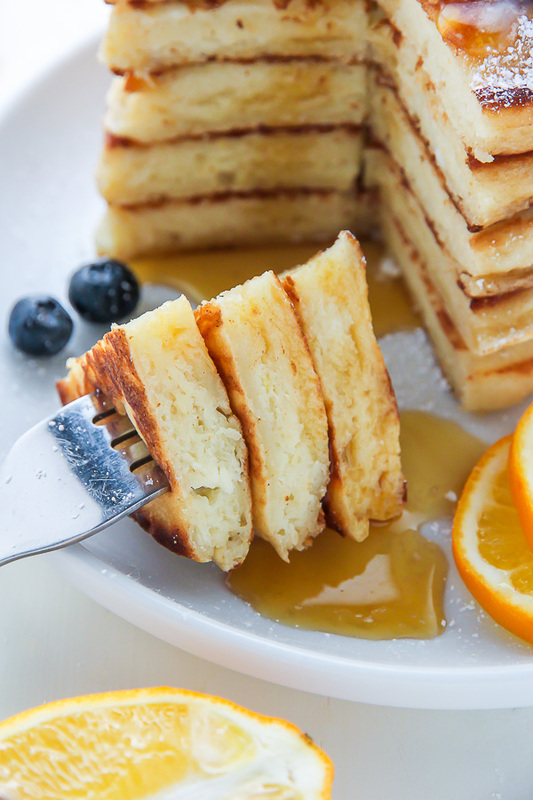 The texture of these pancakes is the so good. We used the zest of a 2 complete lemons rather than 2 teaspoons! I can’t imagine you would taste the lemon with maple syrup otherwise. Looked for this recipe because we had them at a restaurant where they were served with fresh sliced strawberries – what a treat! We made a lot more than 10 pancakes, making them about 5-6″ diameter, I think 12-16. I made these at 7000′ with half the baking powder, 1/4 cup of extra flour, and extra milk until it “looked” right. These are delicious! I didn’t have lemons to use the zest but with only lemon juice they were the perfect amount of lemony. Toddler and adult approved! Thanks for the recipe.